Obituary – Bird, Dorothy Lee (Lau) « Perry High School Alumni Association, Inc.
Red Hots 47-50, Y-Teens 47-48, Library Staff 48-60, Perryscope Staff 49-50, F.T.A. 48-49. 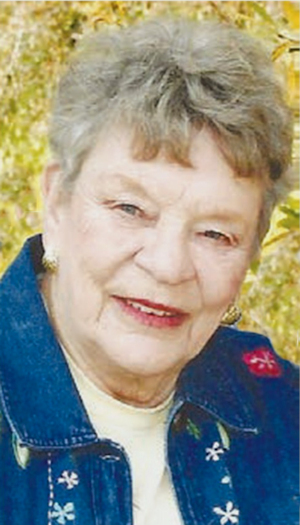 Dorothy Lee Bird (Lau), 86, died peacefully in her sleep on November 28th, 2018 at Ivinson Memorial Hospital in Laramie, Wyoming. In her final days, she was surrounded by her loving husband, Donald, of 67 years, her two daughters, and most of her extended family that she loved so dearly. Born to John F. and May Lau on May 1st, 1932 in Perry OK, Dorothy was an only child. Growing up on the farm, she preferred to help out with the household chores instead of working with the horses, pigs and chickens. While she helped with the animals on occasion, you were more likely to find her working in the house or reading a book on the front porch swing. 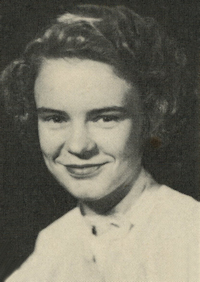 In May of 1950, she graduated with her diploma from Perry High School and the following year, headed to Chickasha College for Women in Chickasha, Oklahoma where she pursued a degree in Journalism. After a blind date in 1949, coordinated by friends, Tom and Leora, Dorothy’s life took a different path. On November 17th, 1951, Dorothy left her college life behind and headed for Cheyenne, Wyoming to marry the love of her life, Donald “Don” S. Bird, on the following day. As a newly married couple, they traveled to Loveland and Denver, Colorado where they enjoyed their honeymoon. Upon their return, they made their first home in a 26 foot mobile home (with no indoor bathroom) that was set up in the yard of a local Laramie couple. In 1953, they became long time members of the First Christian Church, Disciples of Christ. Two years later, on March 17th, 1955, Don and Dorothy welcomed their first daughter, Debra Lynn Bird. In 1957, they traded their mobile home to the couple, whose yard they lived in, for the home and a small backhoe. This marked the beginning of Bird Construction where Dorothy was an equal partner, aka “The Boss”. On June 6th, 1958, Dorothy and Don welcomed their second daughter, Donna Jo Bird. Life was busy and their hearts were full. As local small business owners in Laramie for many years, Dorothy and Don were involved in multiple business enterprises. Dorothy held the Order of the Rose in Beta Sigma Phi, belonged to multiple women’s groups in her church and was an active member of many organizations in Laramie. Dorothy is preceded in death by her parents, John F. and May Lau. Dorothy is survived by her husband, Don of Laramie; two daughters, Debi and Greg O’Donnell of Laramie and Donna and Gary Crandall of Pine Bluffs, Wyoming; her eight grandchildren, Chad and Sarah O’Donnell (Cheyenne, Wyoming), Cassidy and Mitch Biggs (Laramie, Wyoming), Shon and Carter Crandall (San Diego, California), Jennifer Bird (Troy, Alabama); and her six great grandchildren, Ben, Toby, Austin, Liam, Everette and Cashus. Memorial services will be held at 10:30 a.m. Monday, December 3, 2018 at the First Christian Church, followed by an inurnment at Greenhill Cemetery. In Lieu of flowers, donations may be sent to the Dorothy Bird Memorial Fund at ANB Bank of Laramie WY for the placement of a memorial bench in a local park, where she and Don loved to walk together. Services are under the direction of Montgomery-Stryker Funeral Home.